Have you been considering adding planters to your outdoor design? Here are 19 of the best outdoor planters. Having a lovely path leading up to your home that is full of flowers is great, but as you get closer to the porch and the front door, incorporating planters and potted plants into your outdoor décor will help your curb appeal. It will add flavor to your outdoor living space and show your guests a little bit of your personality before they step inside your home. A good planter for your front porch can be made from a number of different materials. Some of the planters that I have included in this list are made from wood, while others are ceramic. The planters that you will find on this list vary quite a bit because I wanted to include hanging options, elevated planters, and planters that sit right on your porch steps. There are several planters on this list that I adore. Firstly, I think that the Amish Garden Wagon would make the perfect accent to a medium-sized garden. I can picture it right in the middle of a beautiful rock garden with some succulent plants around the base of the wheels. You could even put some vines on the wagon and have them weave in between the spokes of the wagon. I also love the REAL Horizontal Log Planter. I have flowerbeds along the edges of my porch; instead of having them edged with stone like they are, these could be buried slightly in the ground to create a gorgeous edging that will give your patio a cabin in the woods feel. Enough about my tastes, let’s get on to the planters so that you can pick out some for your home. 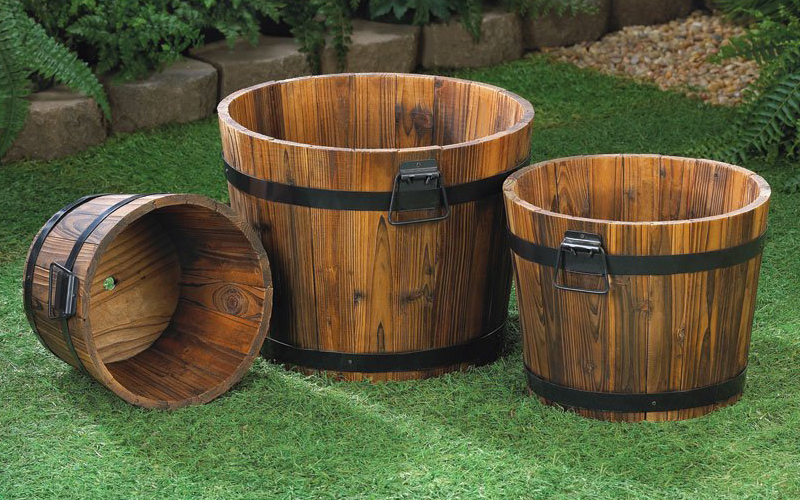 These rustic barrel planters are designed to look like aged barrels full of apples. Each one is stained so that the grain of the wood shows, then the metal trim and handles are added to the design to complete the look. The barrels come in a set of three. The largest one is about 15 inches tall, and each one shrinks about three inches, making it perfect for showing off different sized plants. 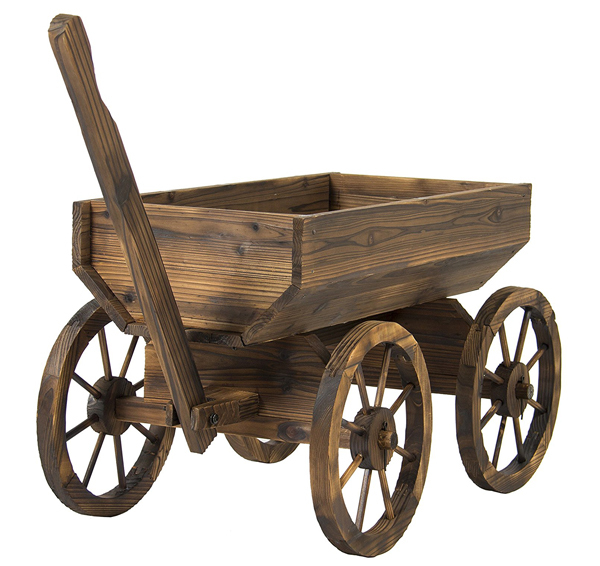 This wooden wagon is perfect for creating an antique, prairie-feel in your yard. This wagon is made from fir, which is what gives it that unique coloration that makes it look like it has been around for years, especially when you take the burn finish into account. 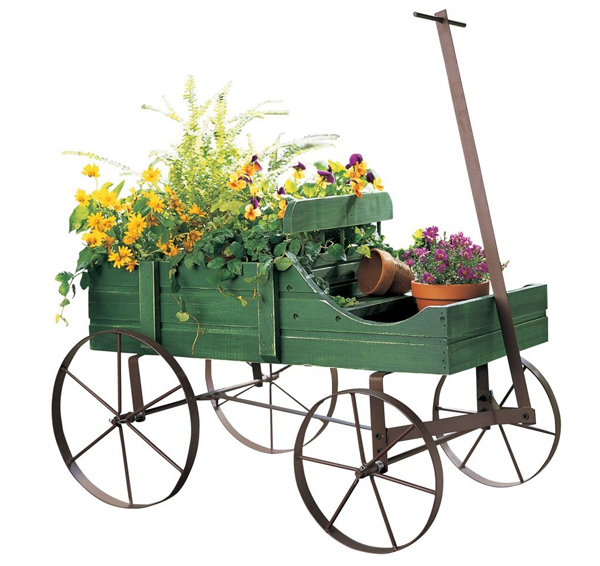 The best part about this wagon is that the wheels actually roll, so you can create the flower arrangement that you want near your home, and then move it out to your garden with ease. This Amish wagon is designed to resemble a real Amish buggy. The colorful body of the wagon is painted green here, but it is also available in blue and red if those colors match your outdoor style better. The wheels are made of iron, so they are actually able to function and move around in your garden. The wagon is a little less than two feet long, so there is plenty of space for an amazing display of flowers. 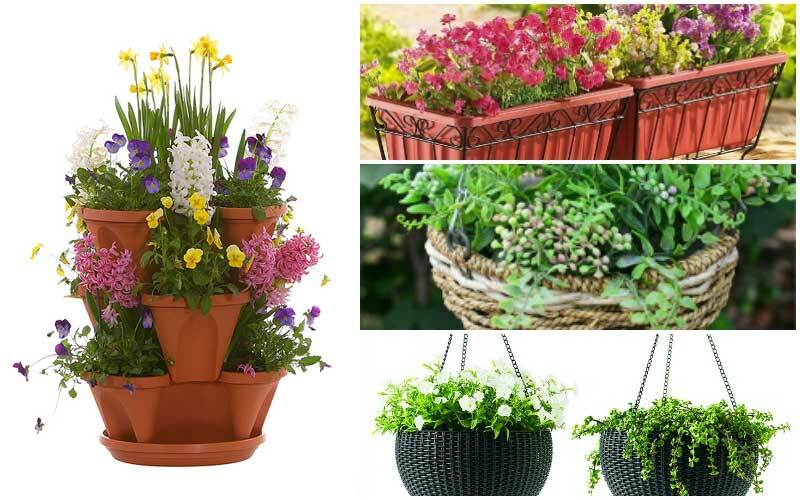 These vertical planters are ideal for an entryway, but they would also look great along the edge of a patio or a deck. The beautiful copper finish is applied by hand and rubbed to make it look like it is really an antique. There is a liner inside each one of the planters so that you can fill it with a lovely display that will welcome your guests into your home. 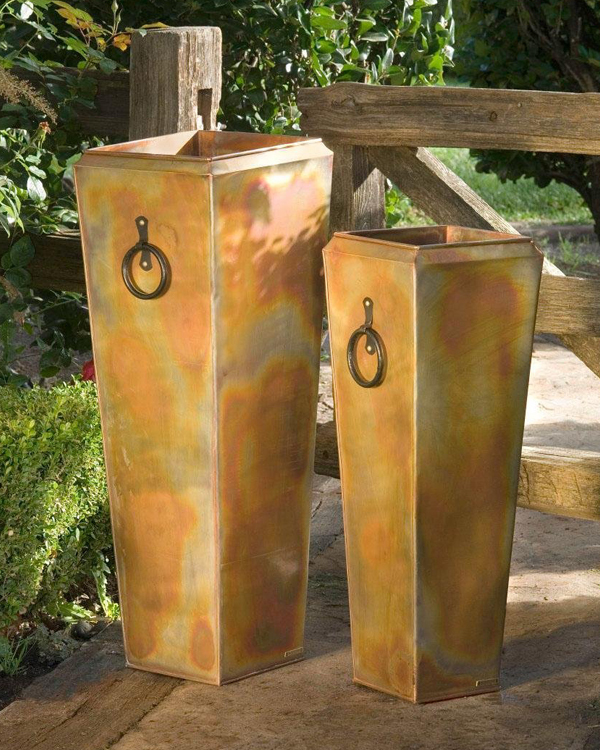 These planters come in a set; the first is 35 inches high, while the other one is only 29. 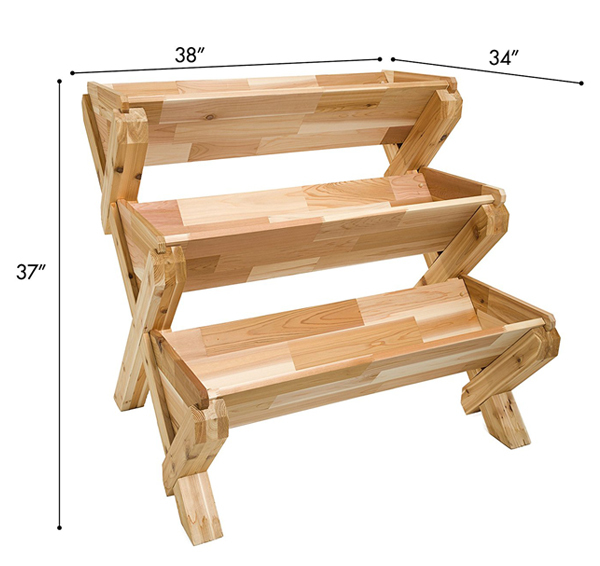 This three tiered planter stand is great for adding a display to the center of your garden. The bottom level features the largest planter, and as you go upwards, each planter gets progressively smaller. In total, this planter is approximately 25 inches tall. 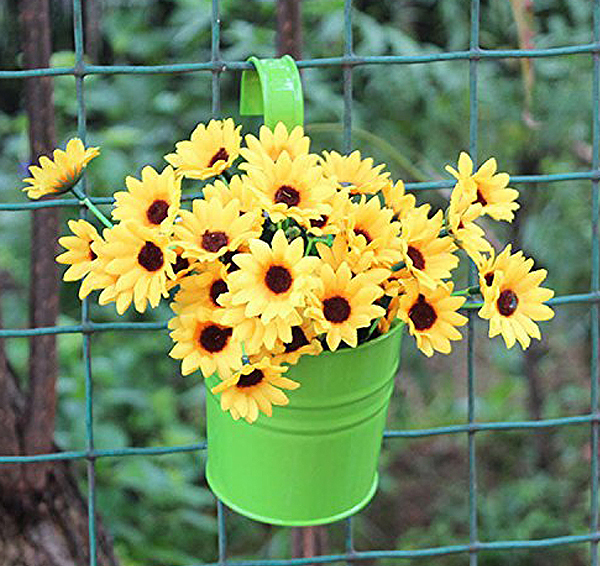 Each part of the planter is made from a durable polypropylene, and they connect to one another using a cylinder that you can easily hide with cascading flowers. This next one is a great stacking planter that can be stacked up to nine tiers high. You’d think that adding more tiers would make it difficult to water, but these planters are self-watering. In fact, they are designed with an interior grid design that helps the water reach the plants. 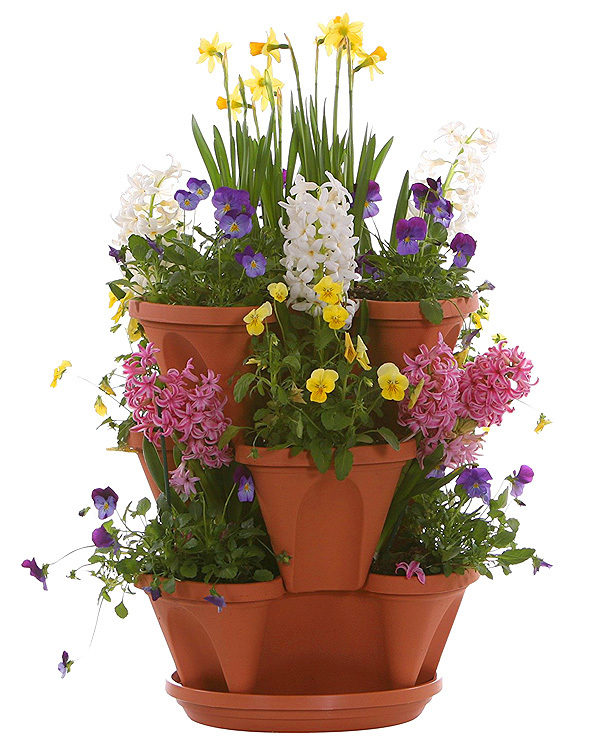 It is the perfect planter for a balcony or a small area; you can display your flowers without leaving much of a footprint. 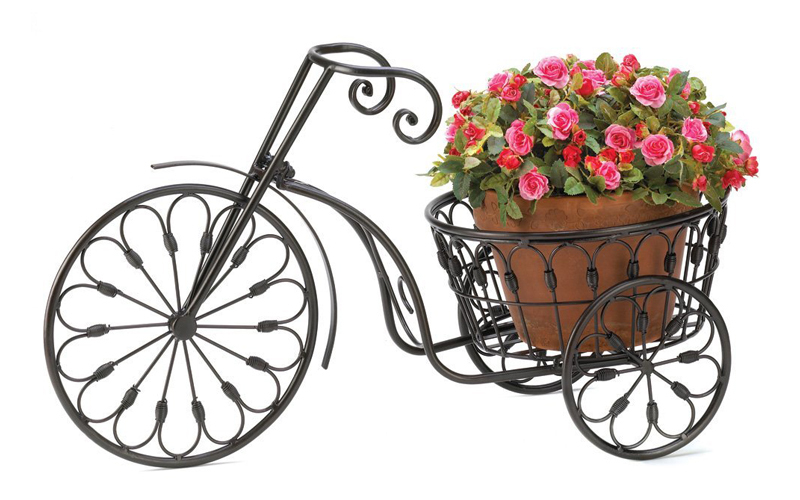 Iron plant stands add a certain flavor to your outdoor décor, but this specific planter was shaped to look like a bicycle. It looks best with a large, colorful plant taking up the seat of the bicycle, but if you choose to select a vine or a climbing plant, then you can use the spokes of the tires to create a unique intertwining design. Unfortunately, the wheels do not actually roll on this bike. 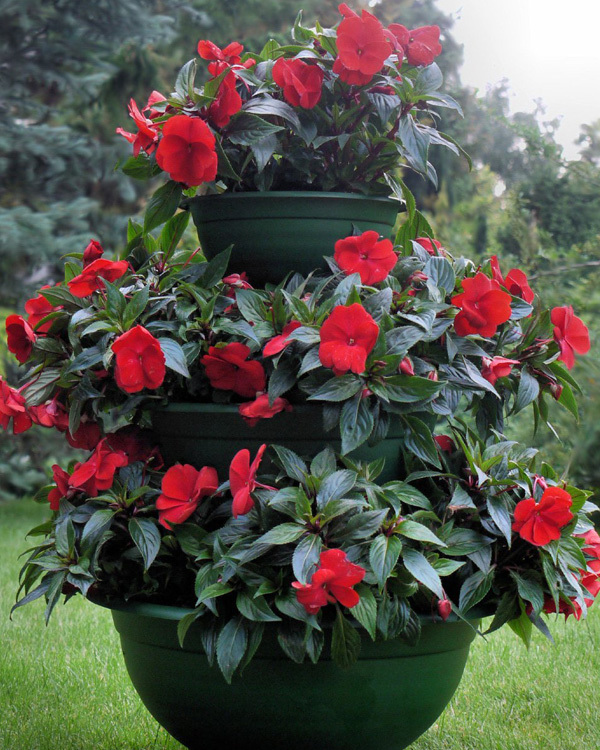 Planters need to be eye-catching; making them the center of your garden will make them a point of local gossip. These ceramic planters are the perfect addition to your garden. The ceramic is a beautiful sandy color that is accented with sage rings and black diamonds. There are three planters that come with the set, and you can put your plants directly into them because there are drain holes in each. These adorable little iron planters are great. They resemble a watering can with an open top so that flowers can flow over the rim. 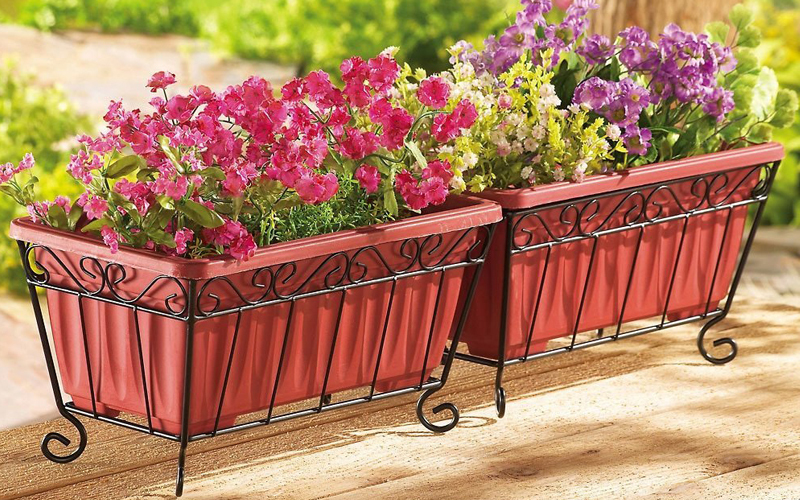 There is a handle on the planter, which makes it ideal for hanging flowers over a balcony, a porch, or a fence. The handle is actually removable, so if you would sooner set the planter on the ground, you can easily do so without leaving the handle seeming out of place. Nothing is more inviting than a few hanging plants on your porch. 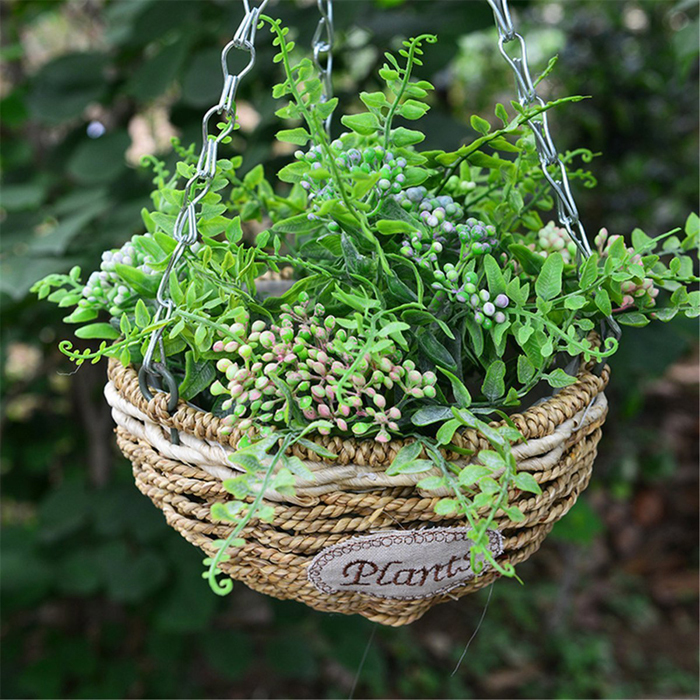 This wicker-style hanging planter is actually made from a polypropylene material that will stand up to any inclement weather and extreme sun. It looks identical to rattan, but it will never fade or unravel. It also has a triple chain design that will even be able to support larger plants. This is actually a set of two, so you can have one for each side of the porch. 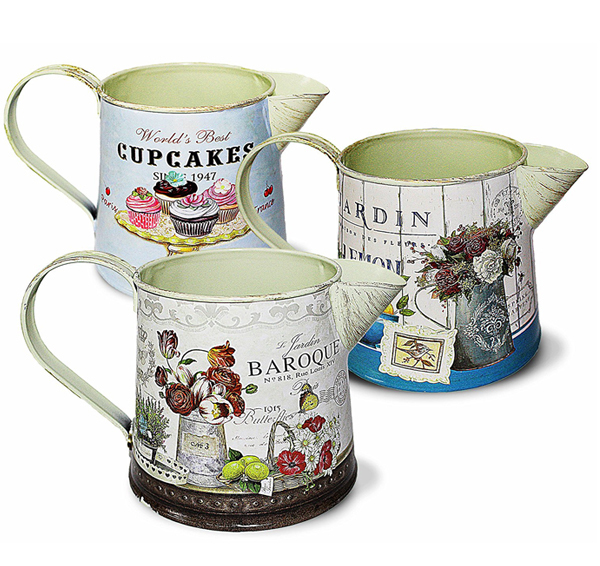 This set of three planters is actually three small pitchers that have been decorated and designed to make your garden display more unique. They add a rustic characteristic to the garden, so if you have a seating area, they would look perfect on a small table. You can even have some of the plant coming out of the spout, giving the planter more of a personalized touch. 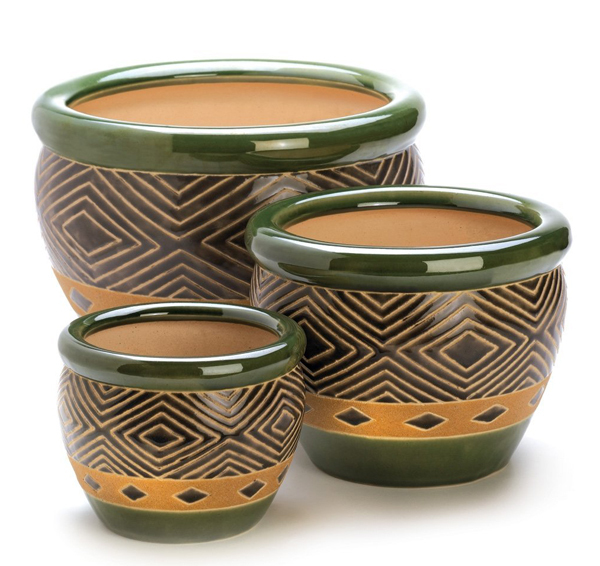 If you are looking to bring colorful accents into your outdoor space, then this set of three planters is sure to brighten up your yard. These planters are crafted from ceramic, and each one is a different color and size. 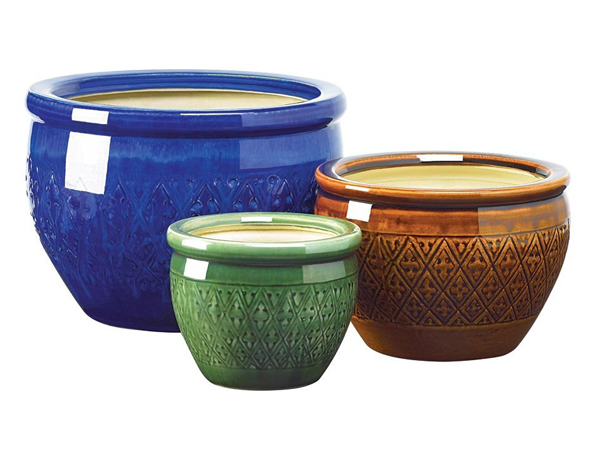 The largest one is bright royal blue at 12 inches high, the middle one is a burnt sienna at about nine inches high, and the smallest one is sage green at about six inches high. This planter is one that is great for several smaller plants to grow in together. Some plants cannot handle the cold winter air, so these rectangular planters make it easy to move them indoors before the frost hits. This is a set of two; the pots themselves are plastic, but the stand is made from iron to give it a bit of stability in the outside air. I personally love the iron work on the stand. 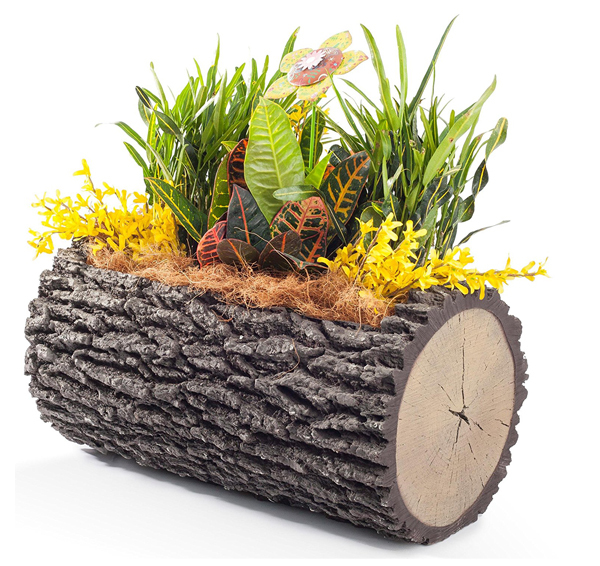 This log planter is great for a cottage-like feel in your yard. It looks like a real log, but this planter can insulate your plants and keep them safe from unexpected changes in the weather. There is even a drainage hole in the design to keep your plants from getting root rot. In addition, these are all hand crafted, so no planter is going to be identical to another. The exterior is also coated with UV resistant and weather resistant paint. When you have limited space, the only way to create a breathtaking garden is to plant up. This cascading planter allows you to do just that. It is crafted from western red cedar, which means that it is resistant to insect infestation and rot. The fact that the top two tiers are elevated also helps protect the plants. This specific planter is designed with three tiers, so you will have plenty of space for your favorite plants. Hanging plants offer a unique look that you should take advantage of. 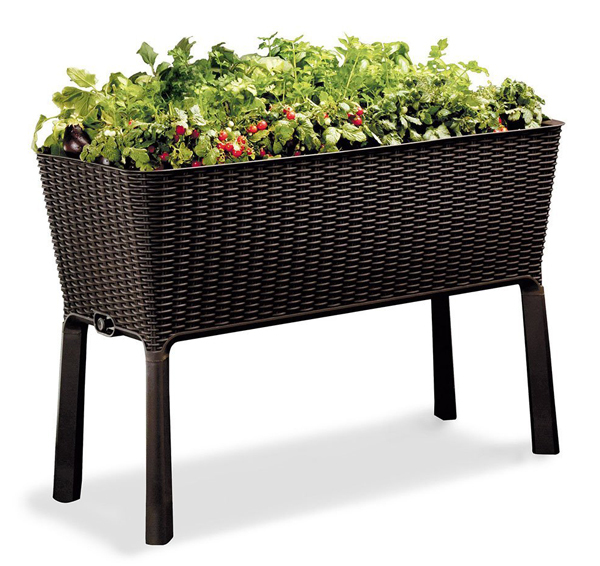 This planter is a handmade straw basket that features a three chain design. Inside the woven basket, there is an iron frame that is designed to offer support and durability to the plant. There is also a place on the front of the planter where you can have a saying stitched into the design. 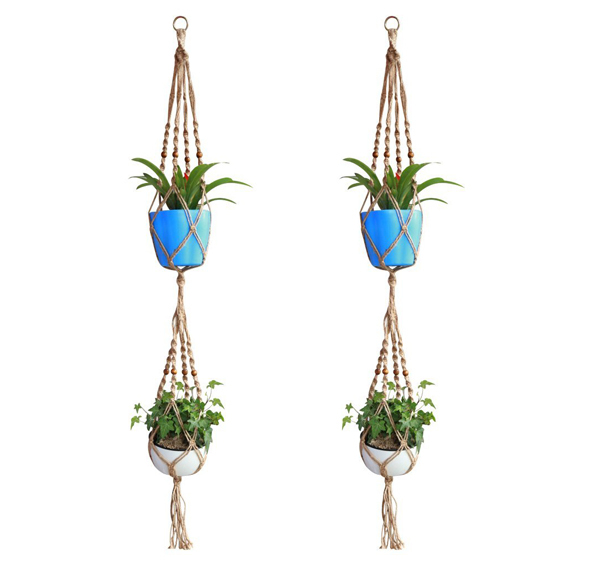 If a single hanging plant is great for adding some exotic feeling to your outdoor space, then a double hanging planter that holds two plants at once should definitely look impressive hanging from your porch. The weave that holds the planters in place is handmade. This means that it is all braided and knotted by someone, and the design is more than amazing. This trough planter is elevated to a height of almost 30 inches, which makes it a great option for the elderly and anyone who has mobility issues. This planter has a design that lets you know when the plants need to be watered. Since there is a built-in reservoir, the water gauge is perfect for letting you know how much water is actually still stored there. When there is too much overflow, then the drainage tap can be used. 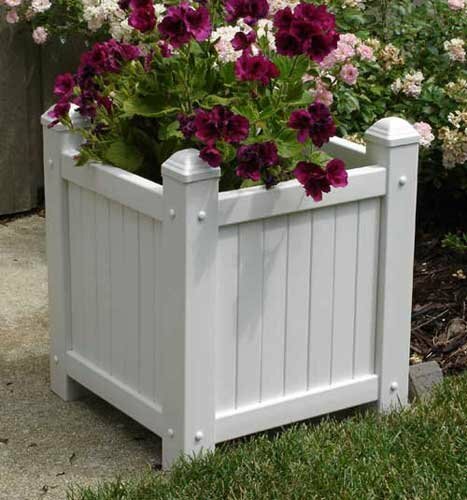 If you have a backyard with a white picket fence, then this next planter is ideal to match your already existing décor. It is actually made out of PVC vinyl, which means that it will not fade in the sun and the paint will never crack or peel. 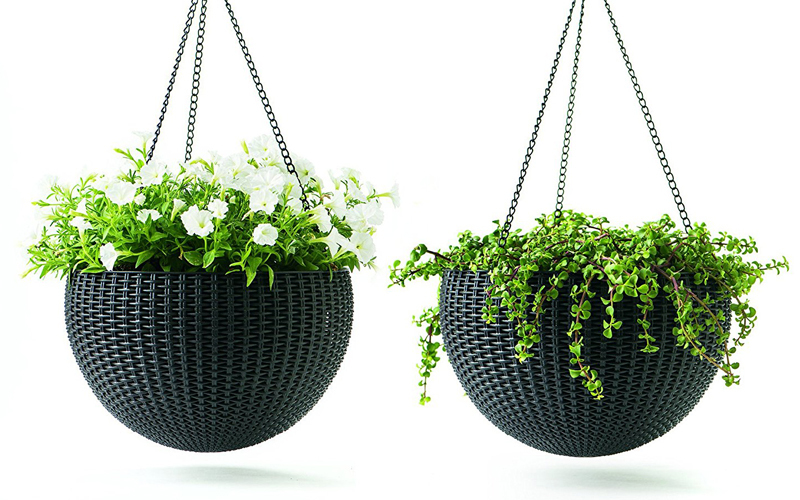 This planter is perfect for tall plants that are often placed behind smaller plants. The best part is that when it gets muddy, all you have to do is spray it down.